A Rokugani officer approached the gates, dressed in his best kimono, and gave a precise bow to the gate guard. "Kitsu Keiji, Captain of Kunshu Maru, is here to pay his respects to Governor Muhaki, if it pleases her," the foreigner informed the guard - at first in Rokugani, then in halting Meranaese. The handsome butler of the estates smirked, handed him a glass of wine, or water if wine was rejected, and led him through the hallway to the other side, where under shaded arcades in rattan chairs one could admire an even more impressive floral garden than in front of the building. A small gazebo-like pavilion loomed somewhere there. "It might please me, Senor." The woman who came dressed in a plum doublet and tight breeches with long white socks appeared after a 10-minute wait. "What kind of respects are you intent on paying?" The Lion accepted the glass of wine and followed the butler to the gazebo where the governor waited. 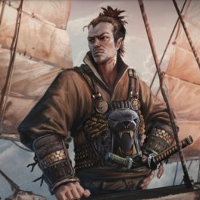 "I Kitsu Keiji, Ship Captain," the foreign sailor said in strongly accented Meraenese, offering a courteous bow. "Governor Muhaki meets Kunshu Maru First Officer, Second Officer yesterday, permits ship to dock. But I come thank Governor Muhaki for graceful hospitality in person." He bowed again. "That is nice of you, Senor. As is your effort to speak how we speak around here." The governess did a quick assessment of the manliness of the Lion captain before her. Comparison to the wooden imitation before Matsu Tonkatsu turned out favourably for Keiji if a low chuckle was any indicator. She nodded back to the man. "But you may be more comfortable if I speak like this?" "As you wish, Governor," Keiji acknowledged with another polite bow. As the captain rose, he produced a bottle from his person and presented it towards her. "If you will allow me, I have a small gift I'd like to offer you, in recognition of the Governor's generosity in allowing Kunshu Maru to dock at her fine port." It was a bottle of good whisky, recently acquired by Keiji from Amigo Winehouse. "Whiskey?" She accepted the bottle. "Why the thought that I like strong drinks?" She looked up at him, curious. "A woman must be strong of spirit to rule such a prosperous port," Keiji replied courteously. "Such a woman surely must enjoy strong spirits." He offered the bottle to her again. She sighed internally. She had heard about this game. After some thought she decided to entertain Keiji with it. Looking up from the bottle, she arched her brow. "I wouldn't say your spirit is weaker than mine. I'd like to see you downing this bottle more than having it myself. You look like a man that could do it and keep his legs on the ground, but maybe I am wrong to have such a strongly spirited confidence in you?" If the foreign captain noticed her pausing to consider whether to humor his strange Rokugani custom, he was too polite to comment on it. "You are kind to hold me in such high esteem, Muhaki-sama," Keiji replied. "But this is not only a drink - it is a token of the esteem with which I and my crew hold for the noble Governor, and the friendship we hope to forge with her and her peoples. In this spirit, one hopes Governor Muhaki might accept this trifling gift." The Lion bowed as he extended the bottle towards her with both hands. "It's a thoughtful gift, thank you, Kitsu-san. Still, you wouldn't mind sharing it with me at some point, in the spirit of forging friendship and all that you meant with it?" She smirked. It was good enough for a little pastime to tease him a bit. "I should be glad to, Muhaki-sama," Keiji agreed, returning a smile. "I'd like to make sure Kunshu Maru and I are welcome guests in your port. Sharing a drink would be a lovely way to become better acquainted." "Your estate here is so beautiful," Keiji commented as he gazed at their surroundings. "I can't claim to be a gardener, but even a humble sailor like myself can see the beauty in your luxuriant gardens." He looked back at her again. "They are the public good of all those people who know how to behave, so feel free to come and enjoy them." She smiled, putting the bottle way, the extended her hand. "There, there is a shrine to Lord Muhaki, but otherwise it's just tamed nature." Keiji craned his neck to look up at the shrine that Yubari indicated, nodding approvingly at the filial piety that a shrine to the ancestors implied. Then he looked around at the gardens once more. "It does require much labour. But governing entails creating jobs and projecting awe, so it's not a bad move to take the effort all things considered. In addition to the beauty of it." Yubari smiled. "If th pretty meets the practical, we're in the best of worlds." "A wise philosophy," Keiji agreed. "I can plainly see why the West Port has prospered under your governance; we were fortunate to be permitted to dock on this side of the island. It's my hope that Kunshu Maru may have the opportunity to visit here more in the future, as well." "With your permission, of course," he added with a friendly smile. "You look like a responsible and sensible man, Kitsu-san." She eyed him curiously. "As long as you behave like that remain in control of your vessel I will not look askance at your... mobility." "This is excellent news for me, Kitsu-san, to have your word on that. It remains to hope that as long as you are here you and your crew shall be exemplary members of this community who I can count on in difficulty." She raised her brow. "You may rely on me, Muhaki-sama," Keiji said with a bow. "If you find you have any difficulty whatsoever, you have but only to tell me and I shall address it immediately." "This is very good to know, Kitsu-san. If you wish to enmesh a little into the operations of this port, you have my encouragement. My man to talk to is Muhaki Aiteru, and I also have an office at the Plaza de Contratacion where a charming young man by the name of Fernando Barquero represents my interests." "Some other occupations are calling me now, but don't be a stranger. Perhaps we'll find a bit of time for an unrushed conversation in the coming days. I assume your fleet does not leave soon." After a nod, she turned around her axis and left.